American Food: An Ideal Phone Plan – What is American Food? 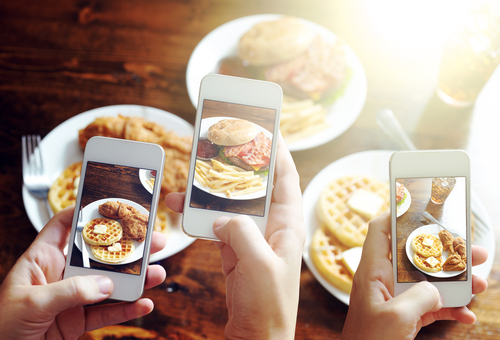 Perhaps not an initially obvious connection, American values surrounding food seem to resemble what we are looking for in our next cell phone plan: family, mobile, and unlimited. This AT&T buzzword metaphor is a cautious reminder of evolving American traditions, behaviors, and desires. From the moment we take our first bite, family heritage, flavors, and recipes begin to shape our tastes and habits. The family dinner table though is competing with the demands of this mobile age as Americans trade-in sit down meals for on-the-go alternatives. The ubiquity of these options has led to creative culinary fusion as well as the risk of abundance. While these cell phone keywords may be what Americans desire in their coverage, the principle that they also adequately describe our food indicates that consumerist desires have seeped into aspects of American culture outside of the retail realm. The first phone plan descriptor is that of “family” which is two-fold in American food; family is where our food comes from and family is whom we eat with. Immigrant families coming together is what has made our country a cultural “melting pot,” a metaphor that could not be more perfect for defining our cuisine as well. Manhattan chef Wylie Dufresne shared his stance on American food with the Chicago Tribune explaining, “What I like about the term ‘American cuisine’ is that it can encompass ingredients and techniques from around the world because that’s what it is.” There are very few other countries whose culinary Pinterest boards would seamlessly incorporate food items inspired from places as far and wide as say Italy and Japan. Not only do our American families influence what we eat, but also how and when we eat. Familial food traditions are significant in almost all cultures yet congregating around the dinner table is unique, and as seen by its inclusion on the board, integral to American food. The most internationally notable American holiday, Thanksgiving, is based on a shared dinner of Native Americans and pilgrims. In a country with tapering religious beliefs, American holidays are commercialized to focus on the family and the food consumed together. Along with shifts in beliefs, modern American culture interferes with these valued family meals as parents work tirelessly to achieve the means to support rapid consumption and children are scheduled from dusk to dawn in attempts to advance their later life outcomes. To adjust, our founding values pull through, as people demand freedom to eat on the go. The class Pinterest board clearly relays the significance of the mobile as portal in that it includes an overwhelming amount of quick goods from energy bars, to packaged snacks, to frozen meals, and take out boxes. Just as Americans take full advantage of our country’s culinary variety, we also exercise choice in where and when we eat. In most countries, eating your sandwich on the train is seen as savage, while in the US, only a few people have the “luxury” of sitting down, as the majority eat walking down the street on their way to a meeting. “Mobile” here also applies to the social mobility of the American dream we hold so near and dear. All our hustle and bustle is rooted in this goal of taking opportunities to do better than ever before, and food for many provided that opportunity. From growth like Auntie Annie’s pretzels that started as a single stand and is now a nation wide chain, or instances of assistance from community food banks, food is a quintessential piece of many American rag to riches stories. American food not only aids this social mobility but also signifies it as explored in the Providence Public Library’s “On the Table” exhibit that analyzed ingredients and cooking tools of various socio-economic classes over different eras. Just as mobile Americans want to do it all without sacrificing their food, we do not only demand flexibility for where and when we consume but also in what we consume. Some may say using “unlimited” as a descriptor is a cop-out but abundance and incorporation are essential to American cuisine making its unlimited nature perhaps its most defining characteristic. A resonating theme in Diner’s chapter on Italian newcomers was that “the immigrants spoke of food, abundance, and choice,” which they took in stride to create new “Italian” dishes in America. Others utilized American abundance and availability to recreate traditional meals, again enabling the huge diversity that still defines American cuisine. Ingredients are not only unlimited in America, but the variety in their transformation has no bounds. In very few places would a donut cheeseburger and a juice cleanse fall under the same category, yet both are American foods. Abundance can clearly lead to indulgence but also allows for options, including the choice to restrain. American food is as diverse as our populous in terms of origin, style, size, and taste, yet echoed throughout is our elementary value of freedom. A founding value in vain of religion, now perhaps finds itself most relevant in the consumer market. The ease in which descriptors of desired phone plans have permeated our cuisine emphasizes the bend of American consumerist desires on our eating habits. “Family” is not only the people we eat with, but where our tastes develop from, “mobile” is not just portable but the social mobility food has allowed for many Americans, and “unlimited” embodies both the resources and variety our country has to offer. In this constantly connected culture, many would argue that a strong cell phone plan not only describes American food, but may also be equally essential to surviving.